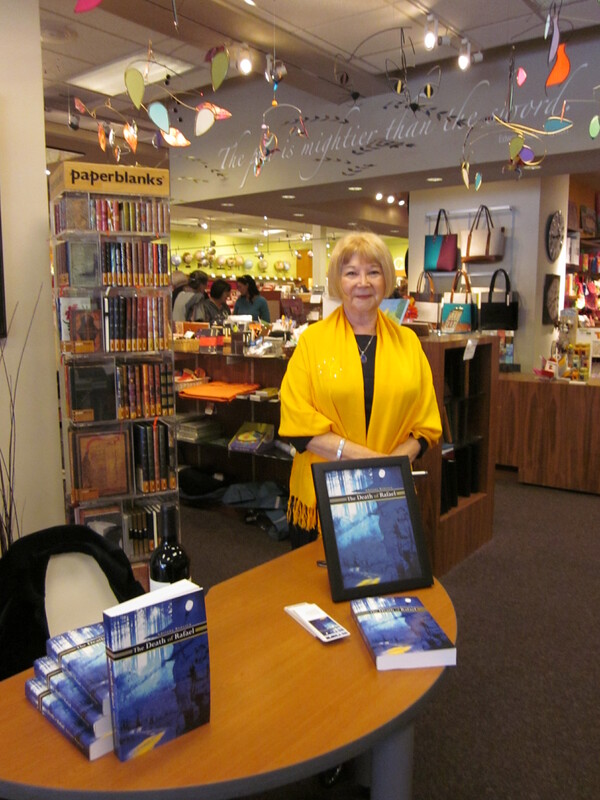 On February 10, 2013 there was a first for THE DEATH OF RAFAEL and for me–book signing event at the prestigious book store Warwick’s in truly beautiful seaside town of La Jolla. I was invited as a local author, part of the Meet the Locals program. It was a first in many ways and a great compliment and statement on my novel–Warwick’s does not invite self-published authors. This was an exception. This is great independant bookstore, with a great selection of books, with staff that actually reads the fiction and non-fiction offerings, presents the best authors and it’s a landmark in La Jolla. I have been going there for years and years, whenever I would be in La Jolla. If you ever visit La Jolla don’t miss this place! As I said, it was a first for me, and I was quite excited about it, greatly anticipated doing this and quite frankly, at some level, dreaded it. This was the first time that I was ‘exposed’ to the public, without filters so to speak. So let’s be realistic. I did well, better than most writers according to the Samantha, the coordinator of the event. But it became quite clear to me that unless you are a BIG name, already known, (a few hours after me, it was Al Gore’s turn to sign books at Warwick’s; a much larger event, I assure you,) book signing is only a modest exposure for a writer like me. More interesting was observiing the people who came in and determine the pattern (yes, the engineer in me was looking at ‘patterns’). First there were the customers who came in as part of their Sunday entertainment–they looked at every rack, sat down, did some reading, wandered around, some I observed were there for the entire 2 hours I was there. They bought no books, had to intention of buying any. A couple did engage me in a discussion, but otherwise kept their distance from any ‘commitment’ to buy. The second kind of customer–blew in then blew out, in the store to purchase a book they already had in mind, didn’t look around, simply focused on their purpose, in a hurry, iPhone in hand, breathless. Third group, and the smallest, they looked around and browsed through books, did buy books unplanned, and these were the people who stopped by my table. It did become obvious, though, that these days, even in the up-scale La Jolla, people did not have the discretionary budget to fork out $ for a book they knew nothing about. Thanks again to Warwick’s and Samantha for inviting me, for being kind hosts and for the wonderful bottle of Cabernet Sauvignon! This entry was written by admiNWD, posted on March 11, 2013 at 7:27 pm, filed under The Death of Rafael. Post a comment or leave a trackback: Trackback URL. You looked fabulous! Thanks for sharing your thoughts, and image.